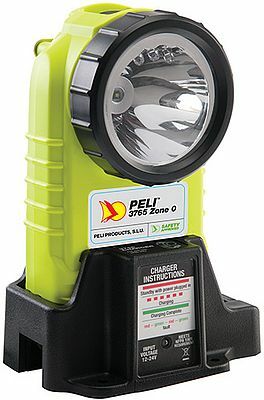 With Safety professionals in mind, Peli Products released the new Peli 3765Z0 Rechargeable Right Angle Torch. Featuring downcast LEDs for illuminating your path, the 3765Z0 LED torch also features 194 lumens (high) and 92 lumens (low), and a flashing mode. Another first is a built in battery life indicator so you will know your battery level before you go in. Compact, rugged, and lightweight, the 3765Z0 LED light contains the latest technology. Certified to ATEX Zone 0 (Cat. 1), this high-performance lighting tool is designed for providing an amazing powerful beam of light, assuring the user a totally safe usage in the most explosion-risk environments; and ecological-friendly by including a rechargeable battery. Conceived for the safest performance in the Fire & Safety, Oil & Gas, Petrochemical, Pharmaceuticals, and other hazmat industries, this torch also includes a tethered Battery Door making it impossible to lose, a Heavy-Duty rear clip for easy attachment to gear, and a fast charger approved by the NFPA (National Fire Protection Agency).